Last week, Dr. Martin Haulena and the rescue team of the Vancouver Aquarium travelled by boat along the west coast of Vancouver Island in search of two helpless sea lions accidentally ensnared by marine debris. Armed with a tranquilizer gun Dr. Haulena quietly approached a group of sea lions resting on rocks. 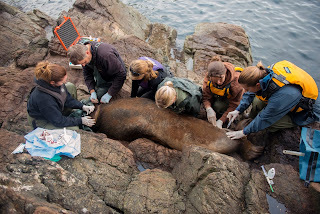 After immobilizing the animals with tranquilizer darts, the veterinary team carefully removed a fish-packing strap that encircled the neck of the first marine mammal. Dr. Haulena made incisions in the strap that was slowly choking the second sea lion, but unfortunately was unable to entirely remove the debris because the animal’s skin had grown over it. Here is a short video documentary about the disentanglement of the two sea lions. Warning for the faint of heart: there are images of open wounds & a little blood. The disentanglement of these two sea lions was part of a groundbreaking project led by the Vancouver Aquarium, and marine mammal consulting biologist Wendy Szaniszlo, to free sea lions from marine debris and fishing gear in the Barkley-Clayoquot region. The collaborative project will also develop disentanglement techniques that currently do not exist to save sea lions. During a six-year period, 408 instances of sea lion entanglement were reported. Sea lion populations are vulnerable and researchers agree marine debris entanglement has a detrimental effect on their numbers. The disentanglement project is based on a recent study, funded by the Clayoquot Biosphere Trust, which investigated the frequency of sea lion entanglements in Clayoquot and Barkley Sounds. Assistance was provided by Fisheries and Oceans Canada, Parks Canada, and Brian Gisborne of Juan de Fuca Express; the Canadian Wildlife Federation provided grant funding. Report it. If you see a seal, sea lion or other marine mammal that appears to be in distress, report it to the Vancouver Aquarium Marine Mammal Rescue Centre at 604-258-SEAL (7325) or Fisheries and Oceans Canada at 1-800-465-4336. Put these numbers into your mobile phone now, so if you see something concerning when you're on a beach you can call right away. Donate! Money given to the Vancouver Aquarium Marine Mammal Rescue Centre will directly support the veterinary team’s ability to rescue distressed marine animals and provide the necessary medical care that allows the Rescue Centre to safely release rehabilitated animals. You can provide your support by donating here today.